Mechanical engineering is the design, production and use of mechanical systems that control and transform energy. Mechanical engineers are trained in statics, dynamics and vibrations, heat transfer and fluid mechanics, solid mechanics and biomechanics, robotics, controls and mechatronics, materials science, analysis and synthesis of mechanical systems and manufacturing. 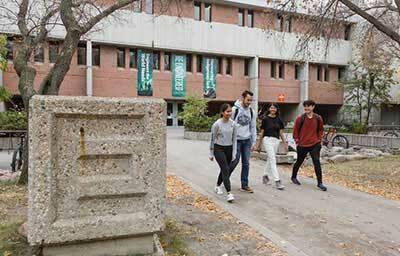 All first year engineering students will take a common set of classes before entering a specialization, such as mechanical engineering, in their second year. This is a basic course on electrical topics for non-electrical engineering disciplines. It explores basic electrical and electronic devices as well as AC power and energy. Topics include force on a wire carrying a current, Faraday's and Lenz's Laws, electromagnetic induction, inductors, self and mutual inductance, DC inductive transient circuits, basic generator and motor principles, basic transformer operation, single-phase and three-phase complex power and power factor correction, transistor switches, basic logic, operational amplifiers and integrated circuits, microprocessor-based controllers, protection devices and basic test equipment. An introduction to production automation and robotic modelling. Topics include: flow line production, automated assembly systems and line balancing, industrial robotics, kinematics, dynamics and trajectory control of robots. The synthesis and design of mechanical engineering components and systems. Students work in groups as a design team on selected projects submitted by industry. Oral and written presentations are made by students during the term with a formal oral presentation and final written report at the end of the course. Evaluations of oral and written presentations are made by supervisors as well as other outside examiners. Lecture material covers design processes and methodologies as well as design aspects related to occupational health and safety. This material is augmented through seminars given by industrial design specialists based on their design experiences. Today’s mechanical engineers typically work in large multi-disciplinary teams. As skilled problem-solvers, they combine an in-depth understanding of physics, chemistry and mathematics with applied engineering science and the art of design. The Mining Option in Mechanical Engineering is six courses and a twelve-month internship that provides a focus on mining industry topics. As an intern you will earn a competitive salary and vacation pay, and may receive a benefits package. You will maintain your full-time student status during your internship. Aside from gaining practical and in-depth experience within a specialized field, interns typically develop strong interpersonal skills, the ability to write reports, present seminars and supervise others. These are employable skills that will allow you to better market yourself in a competitive job market.